App / Container Deployment, Services & Routing App kubectl run cf push Pivotal Cloud Foundry Elastic Runtime myapp.mydomain.net Pivotal Container Service ???? ???? App / Container Deployment, Services & Routing docker build docker push kubectl run kubectl expose App cf push Pivotal Cloud Foundry Elastic Runtime myapp.mydomain.net Pivotal Container Service ???? ???? Pod one or more application containers that are tightly coupled, sharing network and storage. Pod Example: a web front-end Pod that consists of an NGINX container and a PHP-FPM container with a shared unix socket and a “init” container to transform their config files based on environment variables. Deployment a controller that ensures a set number of replicas of a Pod is running and provides update and upgrade workflows for your Pods. Pod ReplicaSet Deployment Pod Example: cloud native Node app that scales horizontally and upgrades 2 pods at a time. 33.6.5.22:80 192.168.0.5:4530 K8s Worker 192.168.0.6:4530 K8s Worker Service track Pods based on metadata and provides connectivity and service discovery (DNS, Env variables) for them. app=bacon 10.3.55.7 Type app=bacon Pod app=bacon Pod LoadBalancer extends NodePort to configure a cloud provider’s load balancer using the cloud-controller-manager. https://example.com /bacon Service app=bacon eggs Service app=eggs Ingress a controller that manages an external entity to provide load balancing, SSL termination and name-based virtual hosting to services based on a set of rules. kubectl create configmap hello --from-file=index.html ● creates a configmap called “hello” containing the contents index.html $ kubectl get configmap hello -o yaml apiVersion: v1 kind: ConfigMap metadata: name: hello data: index.html: "<html>\n<head>\n\t<title>Hello to my friends</title>\n</head>\n<body>\n\tHello to my friends\n</body>\n</html>\n\n"
ConfigMaps/Secrets (user-data) Provides key-value pairs to be injected into a pod much like user-data is injected into a Virtual Machine in the cloud. Allows you to do last minute configuration of applications running on Kubernetes such as setting a database host, or a admin password. ConfigMaps store values as strings, Secrets store them as byte arrays (serialized as base64 encoded strings). Secrets are [currently] not encrypted by default. This is likely to change. Can be injected as files in a Volume, or as Environment Variables. View Using Spinnaker to Create a Development Workflow on Kubernetes. Paul will give an introduction to Containers and Kubernetes and the default development/deployment workflows that it enables. 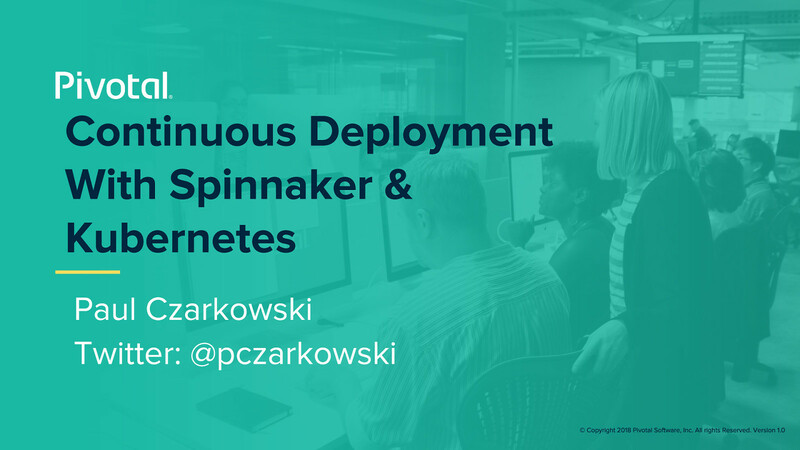 He will then show you how you can use Spinnaker to simplify and streamline your workflow and help provide a full #gitops style CI/CD.